On February 10, 2010, members from the Society of Motion Picture & Television Engineers – Australia Section assembled for a look inside the company HQ of Fairlight, the world-renowned Australian manufacturer of digital audio recording, editing and mixing systems, integrated non-linear SD & HD video and media transfer applications. Highlights included a look at the company’s product “Roadmap” for 2010, and an insight into the software development philosophy of its Research and Development team, heavily targeted towards open and integrated audio/video solutions for “Tapeless” SD and HD workflows. Below are video highlights of the evening. Stuart DeMarais, Sales & Marketing Manager with Fairlight gives an overview of the company to SMPTE Australia members. 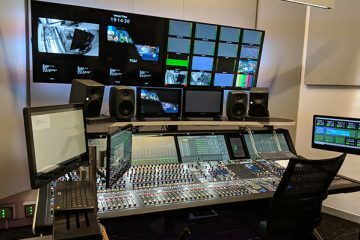 Fairlight Product Support Director Joe Hammer outlines company developments in accommodating numerous video standards into Fairlight’s audio post systems. Warning: items on speaker’s presentation screen are obscured. Fairlight General Manager Tino Fibaek outlines the company’s product development. Warning: This video often features poor lighting. Fairlight Marketing Coordinator Andrew Bell details the company’s product roadmap. Meanwhile, Managing Director Tino Fibaek unveils the new Fairlight Evo console. Fairlight General Manager Tino Fibaek gives an up-close tour of EVO, the company’s latest console.